Hi there my name is Tina. 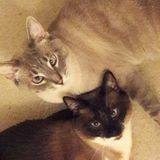 I am looking for daily short term pet care for my cute cats. If it's a good match, will turn into a recurring relationship! Please contact me if interested.